Backed by our years of industry experience, we are betrothed in presenting an excellent quality Aquarium Test Kit. This kit offers a wide range of single and multi-parameter test supplies as well as electronic pocket and portable instruments to aid operators stay tabs on a host of parameters associated with aquaculture and aquarium applications. Apart from it, clients can get the test kit from us at industry leading rates. Many parameters affect the well being and growth of fish in aquaculture and aquariums. Hydrothrem offers a wide range of single and multi-parameter test kits as well as electronic pocket and portable instruments to help operators keep tabs on a host of parameters associated with aquaculture and aquarium applications. HI 3893 is part of Hydrothrem' efforts in addressing the needs of operators in these fields. HI 3893 combines in one package 4 different tests, namely, ammonia, nitrate, nitrite and pH. It is an ideal kit for crab and lobster aquariums and saltwater holding tanks at wholesalers as well as at retail shops. The kit provides 50 tests each of pH, nitrite, nitrate and ammonia. Includes the necessary equipment to perform all appropriate tests. The simplicity of the kit and its affordable price make it suitable for specialists and hobbyists whether technically oriented or not. With an aim to fulfill varied requirements of our valued clients, we are engaged in offering Alkalinity and Acidity Combination Test Kit. This kit is used for testing the alkaline and acidity combination ratio in water. Also, it helps in removing the alkaline and acidity content by providing the accurate statistics. Our engineers provide the working solution and kit that help clients getting pure form of water for using at machineries and plants. 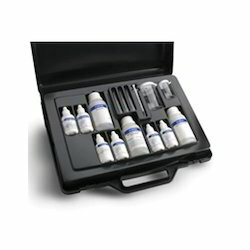 This practical test kit is the ideal solution for combined testing of acidity and alkalinity. The kit includes two indicators, two pre-standardized titration solutions, graduated cylinders for 20 and 100 mL respectively, and a graduated syringe to perform the titrations. The kit also provides two different plastic pipettes (one for each parameter) in order to avoid cross contamination of your sample during testing. The reagent bottles are clearly coded to avoid confusion and can be purchased separately when they run out (See Reagents). Perform over 100 tests each of acidity and alkalinity with this kit. 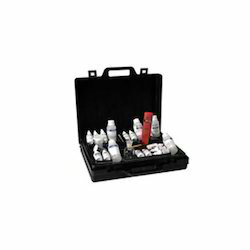 This practical and versatile test kit comes in a rugged portable carrying case, ideal for field use. It's convenient, saves time and keeps your test materials organized and orderly. We are counted amongst the recognized organization offering of premium quality Combination Test Kits for Boiler Feed Water. These kits are manufactured for inspecting the chemical content and impurities found in boiler feed water treatment plant. The offer test kits can measure the substances on a single parameter and double parameters. There are several tests that can be measured using the kits. This includes chemical, alkaline and acidity test along with substances in found in boiled water. All the tests are performed by a titration method, with the exception of the pH test which is obtained with Hydrothrem' pH electronic tester, pHep, which guarantees more accuracy and longer life than traditional litmus paper. Every kit is equipped with all the necessary reagents and equipment to perform over 100 tests (50 for iron and phosphate), and all the reagents can be purchased individually as they run out. All tests are easy to perform with step-by-step instructions. Bestowed with an ingenious team of designers and advanced production unit, we have been able to introduce an exclusive range of Combination Swimming Pool Test Kit. This kit is used to check the lowering oxygen and other compound level in swimming pool water. It is also used for testing chemicals that require having low level in water. This single parameter and double parameter test kits help in keeping the pH value low in water. Our professionals are high qualified and experienced in providing consultancy solutions to the clients along with installation and implementation. Clients can get the solution from us at industry leading rates. Swimming pool water requires daily tests for alkalinity, bromine, chlorine and pH. Chlorine and bromine, which kill micro-organisms, are commonly used in swimming pool water because of their disinfectant properties. Alkalinity and pH are monitored because their concentration in pool water affects the proper activity of the disinfecting agents. Bromine and chlorine tests are colorimetric (color comparison), alkalinity is a titration and pH tests are performed with Hydrothrem' pH pocket tester, pHep, that guarantees greater accuracy than litmus papers and over a wider range. We are one of the noteworthy enterprises engaged in offering superior quality Environmental Monitoring Test Kit. 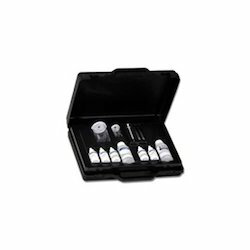 This kit provides a wide range of single and multi-parameter test resources that measure various elements, chemical values, pH ratio and other substances in the water. Our professionals ensure that every ratio meets the level of potable option and use. Apart from it, clients can get the test kit from us at industry leading rates. The six most important parameters monitored in environmental applications, acidity, alkalinity, carbon dioxide, dissolved oxygen, hardness and pH, are covered with this combination chemical test kit. This kit is ideal not only for professionals, but also for students of Environmental Studies, since it offers great performance together with ease of use. HI 3814 is equipped with all the accessories and reagents to perform over 100 tests for each parameter. Our popular pH electronic tester, pHep is included for your convenience. This small and easy to use pH meter will provide more accurate and reliable pH readings than conventional litmus paper and has the added benefit of introducing students to the use of a pH meter. The kit is supplied complete with a step-by-step instruction manual and a hard carrying case which makes it easy to perform tests in the field. Our firm has been continuous gaining appreciation as the prime organization offering of Cooling and Boiler Combination Test Kit. This kit tests the quality of chlorine, nitrogen, pH and other harmful chemicals presence and level in cool and boil water. The test kit has the capability to inspect the exact water cleansing level for portability. There are only several tests that can be conducted using the kit equipment. This includes chemical and bacterial test also. Heating systems and cooling towers require constant monitoring in order to function efficiently. The correct equilibrium of the most important chemical parameters such as alkalinity, chloride, dissolved oxygen, hardness, phosphate and sulfite must be maintained. 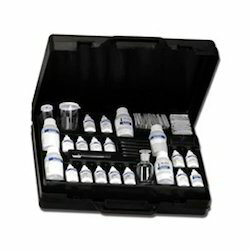 Hydrothrem' combination test kit, HI 3821, includes all the necessary reagents to test these parameters. 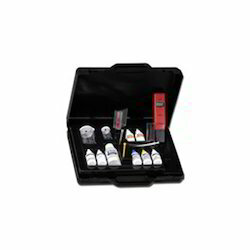 The kit allows you to perform over 100 tests for each parameter (50 for phosphate). All reagent bottles are numerically coded for ease of operation and will allow you to avoid mistakes.